I realized that lugging that framed number around on all of our future weekend vacations would be too much, so I switched to photoshop weeks...and I like it! I wore this loose fitting dress for our facebook pics (coming soon)...so for the belly pic I tried to pull it as tight as possible...not much has changed since last week. 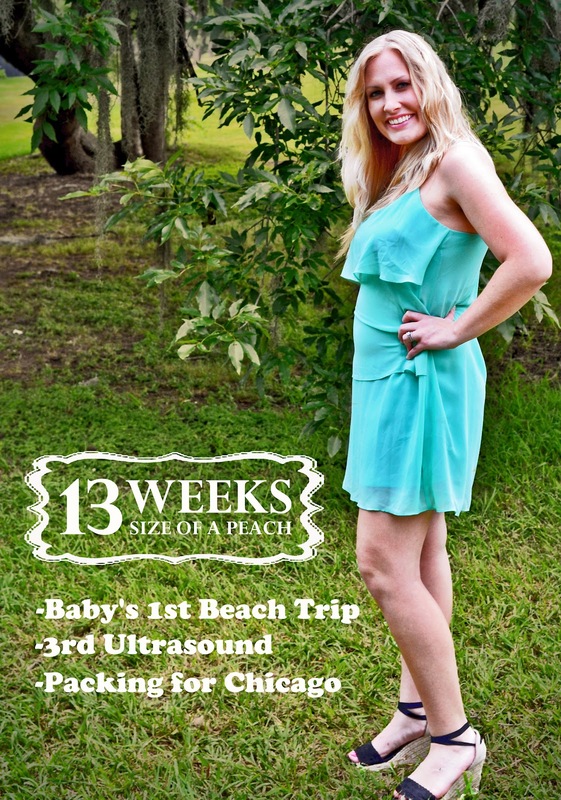 Best moment this week: going to the beach and the 3rd ultrasound…it was a baby! Have you started to show yet: Still just nice and thick! Nausea only comes in waves now…mostly when I am hungry, so I keep eating. :) My appetite is getting better again too…which equals me getting pretty large. I get spells of dizziness in the mornings now…it got so bad that Matt and I got out his blood pressure kit and have been taking my blood pressure. My lower back and tailbone have also started to ache a little every now and then...4th graders don't try to balance on a ball in your yard, you will fall and hurt your tailbone FOREVER! I got my beach trip…a spontaneous trip to Galveston! Not the white sandy beaches we are used to, but lying there soaking up the sun and listening to the waves (eating my Cheetos) was so relaxing and just what I needed. We ate dinner and tried to find virgin mixed drinks at a bar and grill on the beach later, but were unsuccessful so (with Matt’s urging that I needed a treat) I settled for coconut ice cream. In the name of pampering, I also decided to get my hair done this week…a fresh highlight and cut…I am starting to feel much better. Bootcamp was rough though after all the bad food I ate at the beach, but I’ll get back into it. My 12 week 6 day appointment went good...the doctor found the heartbeat on the Doppler within 3 seconds. Got all my questions answered…all i all it was a terrific week. Chicago next! !